In this post, we take a look at how you can build a real-time streaming microservices application by using Spring Cloud Stream and Kafka. This sample project demonstrates how to build real-time streaming applications using event-driven architecture, Spring Boot, Spring Cloud Stream, Apache Kafka, and Lombok. Outputs it to the console. If Kafka is not running and fails to start after your computer wakes up from hibernation, delete the <TMP_DIR>/kafka-logs folder and then start Kafka again. Add necessary dependencies: Spring Cloud Stream, Kafka, Devtools (for hot redeploys during development, optional), Actuator (for monitoring application, optional), Lombok (make sure to also have the Lombok plugin installed in your IDE). 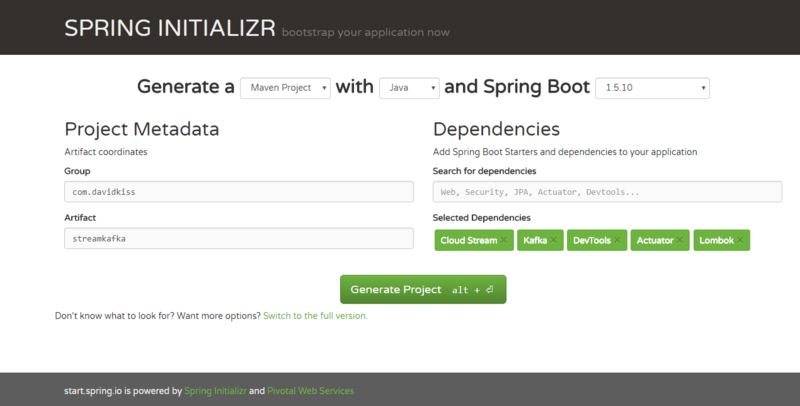 Click the Generate Project button to download the project as a zip file. Extract the zip file and import the maven project to your favorite IDE. In order for our application to be able to communicate with Kafka, we'll need to define an outbound stream to write messages to a Kafka topic, and an inbound stream to read messages from a Kafka topic. During runtime Spring will create a Java proxy-based implementation of the GreetingsStreams interface that can be injected as a Spring Bean anywhere in the code to access our two streams. However, I prefer to use the YAML format as it's less verbose and allows to keep both common and environment-specific properties in the same file. The contentType properties tell Spring Cloud Stream to send/receive our message objects as String s in the streams. Notice how the class doesn't have any getters and setters thanks to the Lombok annotations. The @ToString will generate a toString() method using the class' fields and the @Builder annotation will allow us creating Greetings objects using fluent builder (see below). The @Component annotation, similarly to @Service and @RestController, defines a Spring Bean.